I have fondest memories of drinking Sturm at Raschhofer Rossbräu, a bar/restaurant I frequented while living in Austria a decade ago, give or take a month. It’s an effervescent, not fully fermented red wine, which is cloudy and available only in the autumn. Federweisser is the general term for this category of quick-fermented grape juice, but it is known by many names throughout Europe, and it isn’t produced in the US, at least not to my knowledge. 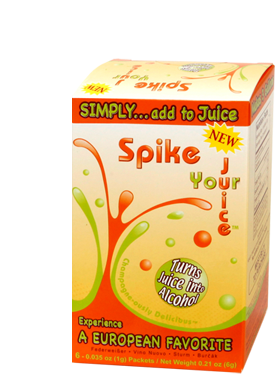 Now, a California-based group of German ex-pats has started selling a kit of six “Spike” packets and an airlock (to keep the bottle from exploding), which convert the sugars in a 64-ounce bottle of juice into alcohol and carbon dioxide, giving you juice with a little effervescence and the kick of beer. It’s reasonably priced, and the airlock is reusable. All you do is add a packet to the bottle of juice (your standard Ocean Spray or Welch’s), replace the cap with an airlock and rubber stopper and let it sit out for a couple days. After 48 hours, you have a half gallon of juice with about 10% alcohol content. The guys at Spike Your Juice were kind enough to send me a sample, and it works exactly as advertised. I opened a bottle of Ocean Spray White Cran-Peach, poured in a pixie stick-esque powder tube and plugged in the airlock, which I had filled with water. A day later it was opaque and the airlock was gurgling out the occasional bubble. The day after that, I was sipping on something akin to the jungle juice I remember drinking on nights in college of which I remember little else. 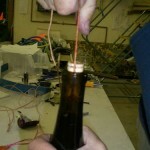 Note: with access to a brew supply shop or the Internet, one could, with a bit of experimentation, make a MacGuyvered spike kit. Turbo Yeast is a versatile, fast-acting strain of yeast blended with nutrients that will ferment up to 20% alcohol over 48 hours, and a homebrew airlock and plug only cost a few bucks, but at less than $10 per kit from Spike Your Juice, it probably isn’t worth the effort. The kit provides 6 packets, which each convert 64 fluid ounces of juice (totaling 3 gallons, or just under 12 liters). A six dollar packet of Turbo Yeast yields 20 liters, but you would have to go through all the effort of measuring and dividing . Wine snobs incense me, and when they ask what flavors and smells I detect in a glass, I often opt to tell them I get a lot of dead yeast on the nose, distinct hints of vine fruit, and fermented grape at the finish. This Wall Street Journal article features a study confirming that wine critics are frauds, that they lie about what and how well they taste, and that the medals given out at wine competitions are as reliable for picking a great wine as monkeys with a dart board. I’m not great at picking out wine. Just because you are on a budget, doesn’t mean you need to drink bad wine. OK, that was tacky. If I ever write like Rachel Ray again, please find me and slit my throat. I’m not a connoisseur, but my pedestrian palate knows what I like and what I don’t and generally, people agree, so here are a few gems I’ve encountered of late. The first three are from Sonoma Valley and the last is Argentinian. Taft Street in Sebastopol is one of my new favorite wineries. I’ve heard that their wines haven’t been the greatest in past years, but when I was up there a few weeks ago, I was blown out of the water by their Riesling, Sav Blanc and Pinot Noir, and as much as I hate to admit it, the Rosé of Pinot Noir was really enjoyable too. All of their bottles run in the $16-22 range, making Taft Street a steal. The tasting room is small but homey and Greg was engaging in how he guided our tasting, not to mention an all-around fun and interesting guy. We walked in as a group of five including one member of their wine club, and departed three members stronger (all four joined really, considering that the 4th is marrying one of the new members). Greg invited us and friends back for a barbecue next weekend, if anyone wants to be my designated driver on the 16th. Gloria Ferrer does fantastic sparkling wines at the $20 price point (often on special at Safeway and with case discounts, I’ve bought it for $12 a bottle). The Brut is fine and I see it around more often, but the Blanc de Noirs is totally tantalizing and tinted pink without being one of those sissy-looking sparkling rosés (which I secretly have begun to enjoy). Worth popping for a celebration, but not so precious that you can’t dump it into mimosas. Rosenblum must be clearing out their cellar of 2005 North Coast Zinfandel, Appellation Series because I don’t see it listed online, but here’s a link to the 2006 vintage. I loved it enough to be shocked by the price. I just picked up a case at their tasting room for about a hundred bucks, making it an $8 bottle of delight! Colores Del Sol only makes one wine, and the 2008 Reserva Malbec is their first vintage, but they hit on a winner. It was introduced to me on a recent trip to Sonoma, despite being an Argentinian wine. After dinner, TSB thrust a glass under my nose, chanting, “Smell it! Barbecue ribs, right?” and I absconded with the bottle after my first sip. I just found it at BevMo for 10 bucks a bottle.